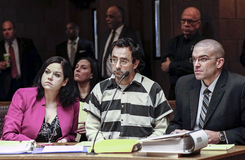 Sexual assault allegations against Larry Nassar, a former team physician with the USA women's gymnastics national team and an ex-employee at Michigan State University, has created key litigation and investigatory roles for a handful of large law firms. And the billable hours are increasing. As Larry Nassar awaits trial on criminal sexual assault charges stemming from his time as a doctor for Michigan State University and USA Gymnastics, those two organizations are shelling out legal fees to a handful of large law firms.